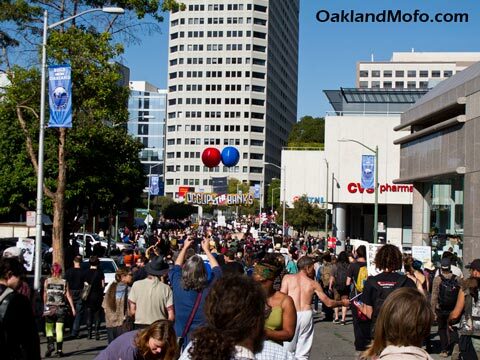 To check for current riots, try the Oakland Police tag. You can also listen to the Oakland Police Scanner app. You can find a free version in the iTunes or Google Play. 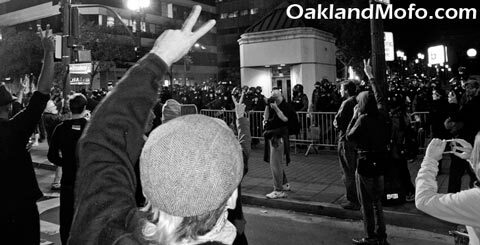 The rest of this article contains photos, videos and experiences from multiple Oakland civil uprisings. Last night I attended the Occupy Oakland march with thousands of other people. Below you will find my videos, photos and stories of teargas and police attacks. Read on. It was a great night full of power, voices, numbers and an all around positive vibe. Until the force of Oakland Police Department(with the help from many other cities from around the Bay) started tear gassing innocent peaceful protesters. They attacked us with tear gas, flash bangs and rubber bullets. I got gassed at least 4 times last night and even after they gassed us it lingered in the air burning for a long time. After many hours of breathing tear gas, you have to wonder if there are long term affects. And with all that could happen in our major metropolitan area in the near future, it could not hurt to have one. They deliberately hurt people, throwing tear gas at a crowd of people helping Scott Olson get up. They shot canisters at protesters heads. The videos are all below. Of course the news did not tell you this. That’s why I am. Police brutality against innocent citizens will not be tolerated. City of Oakland takes action against police who used excessive force on protesters including Scott Olson. Finally. As you can see in this first video there is no reason to use force on the crowd. In my opinion at least 50% of the people are not even out there for any “cause” other than to video and take photos when the police start attacking. So many reporters and out of towners just holding up video cameras. Funny I say that as I’m recording but it’s true. The mad man jumping up and laughing in the video is my good friend shown in the next photo below. As shown, pretty much everyone stood by peacefully with cameras awaiting for the cops to attack. Yes every now and then a crazy drunk guy or “anarchist” jumps up by the police line yelling obscenities like “F the police”, but that’s freedom of speech and no reason to shoot gas canisters directly at protesters heads. That is shooting to kill. 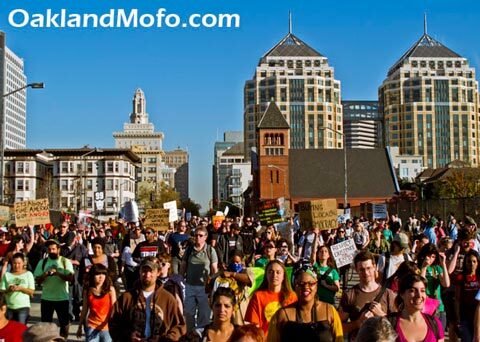 This protest or march or whatever you call it was Occupy Oakland in conjunction with school teachers to save Oakland Unified Schools from shutting down. Here you see and feel the general party atmospheric vibe of an Oakland protest. It is very common for sound trucks, live performances, rolling stages and marching bands to be present during a protest in Oakland. In fact a protest without live music just doesn’t fit in. I’ll admit, there were a few people out there wanting to riot but there was no riot. This damage to the police car was done during the march after the police had already used gas a few times. What did they expect? Why were so many people out there? After 3 weeks Occupy Oakland’s encampment which was an off sprout of Occupy Wall Street was raided by OPD the night before at about 4:30am, arresting 85 people and destroying everything they had built. Their personal belongings were also confiscated and yet to be returned. The tent city had a kitchen, library, kids zone and all. This meant a lot to a lot of people and could have been handled another way by the City of Oakland. Don’t get me wrong, I am not saying they had a right to make a mostly homeless camp city in the park and trash the place but there had to be a better option than what went down. Here you see Boots Riley from The Coup performing at one of the free live hip hop shows. He actually marched with us the day after the police attacks and I got to thank him for being out there and making some of my favorite music. I know I’m going to get flak for this but here we go. I myself, personally went by the camp only about 7 times and found it to be rather disappointing and sidetracked from the actual Occupy Wall Street movement. I know a lot of people and I mean a lot that share this exact viewpoint so just STFU and let others speak instead of alienating yourself against other people who are fed up with the system as well. We need people like me and them that want to do something but disagree with a homeless village as the answer. It turned into way more of a “commune” as many of the Occupiers dubbed it and it seemed more of a place for the homeless to come get free stuff. Some claimed it was “their land” and they were “taking it back” and it is a “new way of living” and even called it “sustainable” and “commerce free”. However it was all bought, paid for then donated. That is a mooch economy and had nothing to do with the big corporations, banks, wars, Federal Reserve and all else wrong with our country right now. So I just honestly could not support and was pretty upset it went from something positive to a food kitchen for the same guys that always hit me up asking me for change when I myself struggle to be where I am. Which is not really anywhere. I mean sure that’s a good cause, but not the Occupy Movement. And a lot of people are homeless beggars by choice, do nothing for themselves, are rude and overly aggressive. I’ll never support that. I also could no longer defend to my friends who saw the same thing I saw. It became a joke and an eye sore. It smelled bad, it made the Occupy Movement look bad and was over all a fail. The City of Oakland only let it exist for so long because it wasn’t a protest, it shut nothing down, it made no difference, it was just there. Until it started becoming a safety and health hazard, then of course they shut it down real quick. But, that got everyone else out in the streets. All of us that didn’t want to come hang out at a smelly tent city but wanted to be heard. Now what are we going to do with this forward momentum? There is a lot going on with this nation and it was good to see so many people out there just like me. A lot of people are fed up and willing to take to the streets. To some it was to take back Frank Ogawa Plaza, which has also been dubbed Oscar Grant Plaza by a few of the Occupiers trying to steal from Oakland’s history. The Plaza was Occupy Oakland’s main base of operations where many set up tents and lived for 3 weeks. I was not out there to take back some silly plaza. I was out there to show support in numbers and let America know we are fed up too! The nation is watching us, just like we were watching Occupy Wall St. and Egypt. The more of us that show support the easier it is for the others to come join us. We know we’re all fed up and don’t know what to do about it. Well just come out. That’s a start. A very simple way to help is to switch to a Credit Union. Take all of your money away from big banks. During this march the protesters(mostly Black Bloc Anarchist) took on the windows of Whole Foods in Oakland and did quite a bit of vandalism. They also targeted other places such as Bank Of America, Chase and even smaller independent run businesses like a dry cleaner. These are the kids that throw things at cops so that the cops may attack all of the innocent protesters at will without discretion. Here you can see the peaceful march going down 19th St from Broadway to Telegraph near the Fox Theater. A lot of good people, hard working Americans that make up the 99%. No one vandalizing or attacking anything. The news would show you another picture and tell you that there was only a few hundred people, but as you can see here, the news is not true. This is the scene just moments before the riot police attacked us for no reason. This was pretty much always the scene. A party in the streets at 14th and Broadway. Oakland style protest. This is the scene after they attacked. ONE person threw a single plastic water bottle towards the cops direction and they started attacking immediately hitting and injuring innocent peaceful people. You can hear a girl screaming out for a medic near the end of the video. This is actually for Scott Olson. A police officer deliberately targeted his face with a highly lethal projectile firing weapon and hit him square in the head with a tear gas canister. This officer should be tried for attempted murder. This is what Democracy looks like…… Peaceful innocent protester attacked by the police. They also purposely shot this guy in the face nearly blinding him. 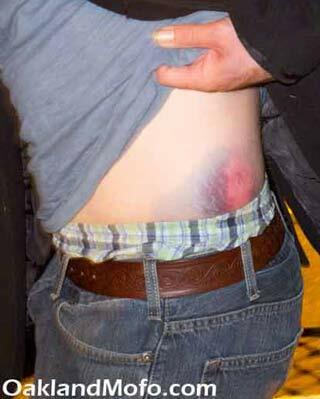 This man was lucky enough to only be shot by a potentially deadly weapon in his side. I did not take this video but it clearly shows police brutality against lovely human beings that are helping the Marine Scott Olson who was also shot in the face by the police. Scott Olson the Marine Veteran was in critical condition fighting for his life and is now on the way to recovery. This is very sad and it makes me want riots and destruction. We were peaceful. They attack and harm us for no reason and need to be stopped. This is not the first time Oakland Police have used “non-lethal” crowd control weapons on peaceful protesters. 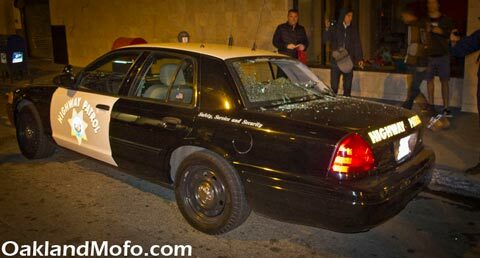 Back on April 7th, 2003 at the Port of Oakland OPD attacked and wounded several protesters without warning. Also be sure to leave your bank for a Credit Union! UPDATE! Day 2. No Police Presence. After Oakland Police attacked the peaceful protesters and made complete fools of themselves mayor Jean Quan decided they will not be present for our demonstration the next day. They did not call on other cities for mutual aid and there were no police at all in our crowd of around 3,000. When we started marching there were very few police anywhere in the city and it seemed like there were more BART Police and Highway Patrol if anything. The march went great, it was awesome and inspiring. No problems at all with no police to cause them. General Assembly. These meetings we usually a lot smaller but on a night after a massive police attack and small scale riots, this huge turn out was expected. A huge march heading through the streets towards West Oakland. Near the end you hear the typical protest chant of “Take the bridge” but it never even came close to happening. The Highway Patrol is always sitting ahead at the freeway on ramps making sure the aimlessly wandering protesters do not close down the Bay Bridge. Some people forget this is still Oakland and get jacked in a crowd thousands. I saw a girl get her really nice Nikon camera ripped right from her hands on Telegraph and Grand Ave and the guy just ran off easily with no resistance. Not a soul tried to stop him as she screamed for help and many nearby people saw it. In fact, I think the war on gentrification really started with Occupy. Many local black residents of West Oakland would yell at protesters to go home and that it’s not their city and a lot of really racist stuff. 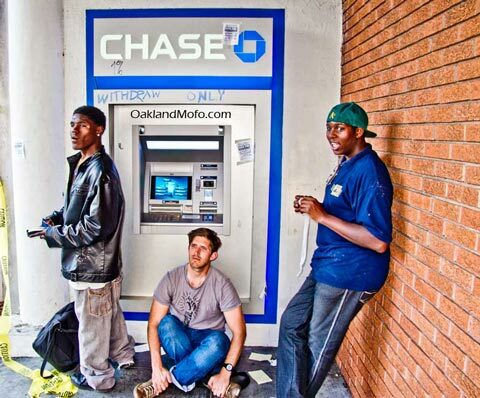 They started hanging around in groups of thugs downtown and robbing more and more Oakland transplants. 2011 was the beginning of an alarming trend and now Oakland tops the country in robberies a few years in a row. It started with Occupy. Locals realized how easy it is to rob new residents and visitors, blatantly in public. Violent Protesters! This goes back to my point being Occupy protest are just a bunch of people standing around waiting for the cops to attack so they can film it. Just a drinking in the streets mixing and mingling party atmosphere. If the cops stayed away, people would get bored and go home. I admit I met a girl at Occupy during the General Strike of November 2011 and we dated off and on a few years. It was a great place to meet someone with like minded views and it is one of the main reasons behind the large crowds and party vibe. Last man standing in a tree! Running Wolf. I wish I could remember how long this guy lasted but they just could not get him to come down and people would sneak him supplies. Well Oakland we did it again. We pulled off an amazing event for the people by the people. We showed the nation and the world that we mean business and we were out there in large numbers. On our way to the Port of Oakland. I have seen some media reports claiming we were only “hundreds”! We must have been at least 30,000 strong and they don’t say a word about that. So far the media has only focused on on a little violence carried out by the Black Bloc Anarchist. A few bank windows were broken, a Whole Foods was smashed up and a fire was started in the street. This isn’t the protesters it is the small group of Anarchist using our numbers for their goals and tainting our name in the media and provoking attacks by the police. This same group came out during the Oscar Grant protest to incite riots as well. Good citizens and protesters tried to stop them from vandalizing and the anarchist tried to attack them too. But does the news cover that? No. 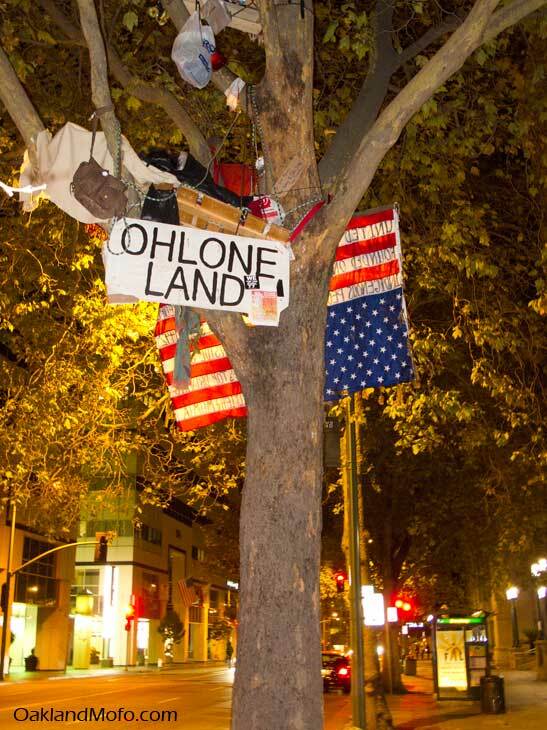 They tell you that wild Oaklanders tore up their city again. This is NOT the case and anyone who was there can tell you that. The event all together was amazing. Being part of it felt like something major because it was. We are not alone and many feel the same way we do and are willing to take to the streets to show it. I arrived around 12:30pm and 14th and Broadway was full of good people carrying nothing buy joy and pride. There was music, dancing, speeches, great signs, people handing out stickers, papers, pamphlets, free water and more. Then it was time to march! About 2:00pm we took off heading towards the banks to protest them being open. At this point I saw about 20 or more of these anarchist all rush together wearing their masks and hoodies with backpacks full of supplies heading for the front of the march. Along the way they broke out several bank windows along Webster including Chase, Wells Fargo and a small financial institution. My good friend is a security guard at one of these buildings that does NOT house banks. They attacked his building as well breaking windows on a small business dry cleaner and a few other places for no reason. So I stopped to take some photos. By this time they are carrying onwards and attacked Whole Foods as well. 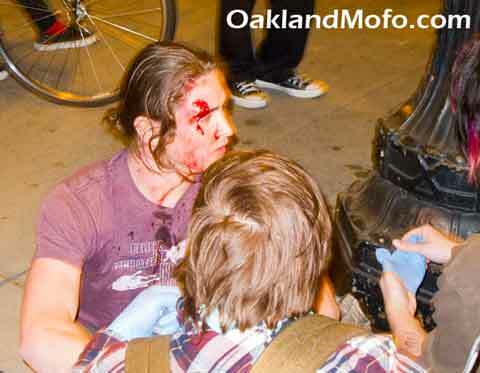 Luckily they were caught on video and hopefully this can clear Occupy Oakland’s name of the unwanted violence. Some of the protesters tried to stop them and they attacked them as well. This has to be stopped. What can we do? They were in large numbers by the end of the day starting fires in the streets and even throwing things at police again trying to provoke riots. And they got us tear gassed once again. While we stand by peacefully they give us a bad name, the media reports that it was us and no one who wasn’t there knows the truth. I liked the first march, we were very visible and took a highly traveled route getting support from all the cars along the way. People everywhere saw us, waved and honked happily and told us they supported us. Sure those few acts of vandalism happened but whatever. It was great overall. The second march I didn’t really understand. 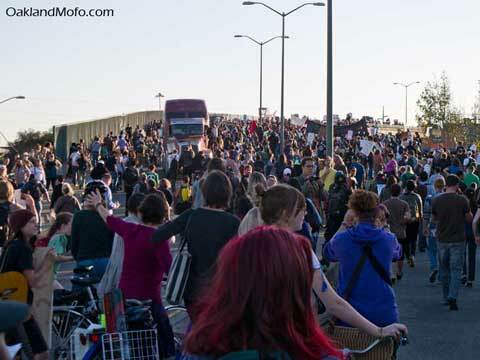 I don’t know what we think we accomplished by marching on the Port of Oakland. It was night, I saw very few ships and didn’t see any full of cargo. We supposedly stopped one shift from coming in to unload, but unload what? Did they do it all ahead of time because they knew we were coming? Did they wait till we left and come in late? Or was it just a slow day at the Port with minimal containers to unload? The Port of Oakland is not a bank and they haven’t done anything to us. In fact they employ a LOT of people. I myself used to work there in the IT Department and can say it was the best place that I have ever worked. Very friendly people that are not out to do any wrong. As for who we blocked? We didn’t really block the “Port of Oakland”, we blocked the shipping companies who rent their space. Again, from what? Did anyone see any full ships? There were so few trucks there, no train yard movement. It was a ghost town. Could it be because they truckers themselves striked the 2 days before due to explosive shipping containers arriving? When the Port is in full swing there are lines of trucks for days, trains full of containers and so on. But that’s usually early on in the day or when major ships arrive stacked full of cargo. I was against the idea but marched anyways with a bunch of my friends to be one of the numbers, to show support and to let others know we’re all out here in solidarity. I kind of think whoever came up with this idea wanted to steer us away from downtown or where others can see us. But around that time of night there is not a lot to shut down anywhere besides like Walmart or something. Regardless of what I find to be misdirection a lot of positive came form the General Strike. March on Occupy Oakland. I will continue to join. I just hope we have better ideas in the future. More proof that Oakland protest are just a giant party in the streets. In fact, my bet is if Oakland hosted a monthly shut down of downtown party in the streets night there would be a lot less people with the fear of missing out over a single protest here and there. Oh wait, Art Murmur tried that and people got robbed and beat up all the time and even shot and killed. More typical Black Bloc Anarchist damage in Oakland. A Occupy / May Day protest on East 14th. Smells like 1% behind Police Lines. This was actually the Oscar Grant riots when they marched into my neighborhood and started breaking car windows and what not. My friends were texting me saying “I see your house on the news chopper feed” and I was just like “yeah I made a drink and am out here recording”. Anyways, please share if you liked. I’ll be updating and adding more over time. Oakland is FILLED with lawless, unruly people! Most of the Oakland scum hangout on Broadway and smoke dope all day. Then they have demonstrations and these animals begin to riot and loot the areas they live in everyday! After the parade on Friday, I am sure they will only be more! I hope the Mayor does NOTHING, so the world can see what these savages will do to their own town. Black on Black crime is the plague of the 21st century!…. but SADLY no one is demonstrating or marching or doing any thing about that. So the protesters started out peaceful yesterday until nighttime. 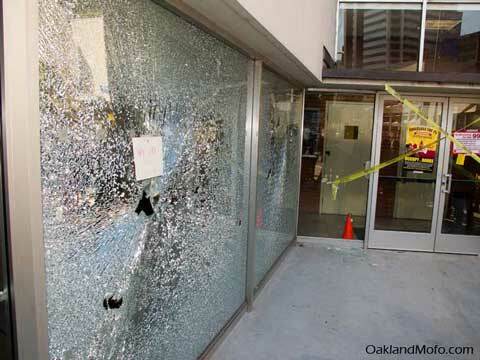 Why would Oakland protesters target car dealerships and banks when there were no police around? I saw some moron with a shovel smash the window of a car dealership. Then the fool runs in the dealership and starts hitting cars parked on the showroom floor. WTF does that have to do with a black man getting his neck broke in the back of a police van? These stupid punk kids are destroying the city of Oakland and costing business owners thousands of dollars. These business owners should send the repair bills to the ACLU!!!! I would like to know how come people riot (I mean protest) when the cops kill a black man that is robbing a store, but everyday they kill each other, sell kids drugs and adults are killed by gang related shootings. Our nation is broke and falling apart and we send money overseas. Maybe you guys should think about what you’re protesting, maybe you should protest something that’s worth protesting.